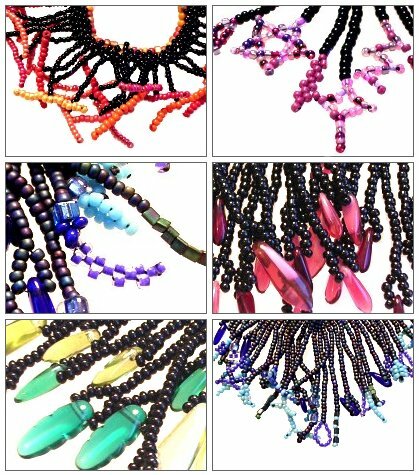 A day exploring fringes and ways to use them in beaded jewellery. We will start the day by beginning a sampler bracelet with over twenty-five different fringes, all with variations. The beaded bracelet can then be worn once finished and also kept as a reminder of the different fringes covered. All of the fringes covered can be used for the necklace you start on the day or in other beadwork. We then move onto beading the actual necklace using the fringe ending of your choice. There will be examples of different necklaces to inspire you. Whilst this day is suitable for all levels of beader you may find it easier if you have some beading experience. An intense day, which will provide you with a lot of knowledge you can use in your future beading. Note: This popular class is available as a pattern here but the class covers it all in-depth with lots of demonstrations and variations.